This post is related to a small series by another blogger and I suggest you read that series also to get a well-balanced and rounded view on wedding receptions. You know what happens in a typical wedding reception – meet, great, eat and beat the hell out of there if you do not know the couple well enough and usually we do not for most of the weddings we are invited to. For the others we are not invited but are a part of the wedding. So when we go for a wedding which is a social compulsion you know when the groom or bride or their families are known to you or your family and you end up at the wedding for the usual eat greet, I mean meet, greet etc. I have the habit of being in time for the actual wedding because I personally feel that it is meaningless to start off with just the eat bit and I would like to part of that special moment for the new family that is starting on that day irrespective of the couple being aware of our presence. So I attend the wedding ceremony and proceed to the hall where the reception is held and usually the wedding party is late to the hall because when you enter you see a crowd who have reached there and are waiting for the couple. Then you see the reception, the prayers and speeches, the toasting with the mandatory wine or grape juice and cake etc. Here a word of mention for the toast, the wine or grape juice is looked upon suspiciously by some who suspect that they are being served liquor and when they learn that it is grape juice promptly gulp it down, never mind that the cake and wine / juice have a role and need to remain in the hands for some time. So after these activities there is some kind of invisible signal that is given by some unknown person in every wedding which starts a stampede. In many weddings there will be one clearly visible uncle whose biggest contribution will be to show the famous signal for the “getti melam” at the time of the tying of the thali, but this signal seems to be unseen and the sender of the signal is invisible but the after effects are amazing in a few seconds a large line is formed in front of you ready for the greeting bit. Before you get over the shock you find that there are atleast 30 people ahead of you. So you reconcile yourself to the long wait and then you see some people cutting lines and some entering the stage from the wrong side usually with the support of someone close to couple making you wonder if they are more privileged than other ordinary mortals on this side. Then the mandatory photo shoot where you are expected to hold a smile till the battery of photographers complete their job. Finally you move to the next item on the agenda the wedding feast. You are usually late because there are many who have beaten you to it and are busy with the task on hand. You find a place and finish the meal and towards the end you have to endure the looks of those waiting for your seat and whispering a silent prayer that tomorrow will still be a good day you move on. These days I have understood that it is simply smarter to eat and then greet especially when I have my daughter with me. These days more weddings are moving away from the loud and often awful sounding music troupes to troupes that focus more on instrumental music which is pleasant and quite enjoyable at times. Sadly most people ignore them and I often feel bad that they do not get their due. In between this hectic meet, greet schedule I try to squeeze some time to listen to the performers and applaud their efforts before getting into the race for the next activity. 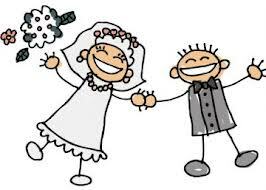 A wedding requires the bride, the groom, an official and two witnesses and all the others are not required. In fact for civil weddings the others are not allowed into the register office. However for us it is an event and whether it is our wedding or we are just guests, everyone seems to love a big fat Indian wedding. Never feel ashamed to cut the queue. I have never heard of people fighting if you cut the queue at weddings. You would not want to do it at the train ticketing counter or Ration Kadai. Greet and Eat - You will probably look less tired in the wedding photos and videos. Agree with you. We don't need more than the bride, the groom, an official and two witnesses and all the others are not required. Don't understand why do we spend crores on these weddings. Most of mega receptions also employ child labour... quite illogical and illegal too. Hehe... we Indians sure love noise and huge gatherings. I try to avoid weddings whenever I can. if it's someone close, then the chance to dress up and walk around organizing things and hanging out with the cousins, makes it fun. @The Psuedonym: You are the expert at this and the inspiration for the post! @Ganesh Puttu: Make time at least for your wedding!